Himalaya - Travel Himalaya destinations which are full of amazing sights, blessed with all the natural bounties, surrounded by towering peaks, trekking and hiking trails and known for their immense natural beauty all over the world. In the first quarter of the 20th century, George Francis Light, a young English subaltern, likened the plains of India to one vast prison in which the sun, aided at one period of the year by hot winds, acted the part of jailor. For Englishmen toiling in the plains, a sojourn in the hills was a welcome escape, liberation from the dungeons. They established hill stations on the periphery of the Himalayas from Shimla to Darjeeling. These townships were cast in the mould of small English hamlets, which reminded the colonial masters of their homeland and provided a temporary relief from homesickness. These also served as cantonments, sanatoria and resorts. In time, schools, hotels, hospitals, theatres and malls were built up. Shimla was designated the summer capital of the viceroy and the annual exodus from Calcutta and then Delhi, was a hallowed ritual. Rudyard Kipling has immortalized the life and times of Anglo-India in his stories and sketches. The stern officers and custodians of the Raj behaved like schoolboys playing truant once they broke loose from their desks. Not everyone pursued pleasure. 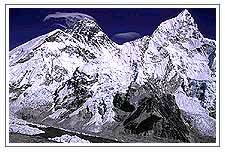 It was during this period that a systematic study of the Himalayas was undertaken. The enthusiasm of administrators resulted in exploration and construction of roads, bridges and so on. The Himalayas became more accessible and familiar to the common man. Its breathtaking beauty continues to revive visitors. The capital of Jammy and Kashmir and the largest city in the state, Srinagar (1,730m) is famous for its canals, Houseboats and Mughal Gardens. The city itself is quite unlike most other large Indian cities for here you are much more in Central Asia than on the Indian sub-continent. Ladakh is full of amazing sights - strange Gompas perched on soaring heights; the barren, shattered looking landscapes splashed with small brilliant patches of green; ancient palaces clinging to sheer rock walls. 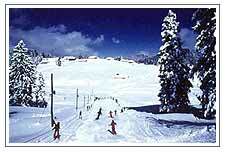 Located in amidst fragrant pine forests is a ski resort in winter. It has a choice of slopes ranging from a beginners run and slalom slope, to sharper descents for the experienced skier. Surrounded by towering peaks at an arm length, Manali's major asset is its proximity to the snowline. It is a flourishing orchard industry, a popular honeymoon destination and trailhead for numerous treks as well as a great countryside ideal for adventure sport lovers. Dharamsala over looks the plains and is surrounded by dense pine trees and Deodar forests. A nearby snowline with numerous streams and cool healthy atmosphere makes the surroundings very attractive. A busy bazaar town, Dharamsala has established itself as the travellers base camp, who come to explore the nearby mountains. Lahaul & Spiti are two remote Himalayan valleys of Himachal Pradesh lying on the Indo-Tibet border. Strange, exciting, primitive, these valleys are incomparable in mountain scape, in the rugged beauty of their rocky escapements and the splendor of their snow covered peaks. Mussoorie is located in the Garhwal hills. Due to its immense natural beauty, Mussoorie is known as the queen of hill stations. Mussoorie is an excellent respite for tourists and people who want relief from the hot sultry conditions of the plains. Nature has gifted Mussoorie everything which makes a place beautiful. With the onset of summers tourists start coming here. Rishikesh is just 24 Kms from Haridwar. Located in the laps of lower Himalayas, this place is considered to be the access point of three other pilgrim places of Badrinath, Kedarnath, Gangotri and Yamunotri the four great places which combine to make Chardham. For unabridged adventure, unadultered natural splendours, Uttaranchal has two destinations dotted all over with breathtaking surroundings, Kumaon and Garhwal. These pretty residents of Uttaranchal are a discovery in their own way for any adventure lover. Gangtok, the "Lofty Hill" or the "Hill made flat to build the Gangtok monastery in 1716". Gangtok is a city, which, till one sees it, one would believe exists only in picture-story books. Kathmandu with its unique architectural heritage, palaces, temples and courtyards has inspired many writers, artisits, and poets both foreign and Nepalese. It boasts a unique symbiosis of Hinduism, Buddhism as well as Tantrism in its culture which is still alive today as it was hundreds of years ago. South of Rangdum stands the Pazila watershed across which lies Zanskar, the most isolated of all the trans Himalayan Valleys. The Panzela Top is the picturesque tableland adorned with two small alpine lakes and surrounded by snow-covered peaks. For well over a thousand years, pilgrims have journeyed Kailash Mansarovar to pay homage to the mountain's mystery, circumambulating it is a ancient ritual of devotion that continues to this day.